Welcome to the Team Challenge, an event where thinking is challenged just as much as teamwork. In this event teams are given the same objective - score as many points as you can. Almost everyone interprets that as a competition and races off without planning, thinking, or understanding how to maximise earning points. Subsequently the first phase of this exercise is perceived as being competitive instead of collaborative. No effort is made to maximise points as teams actively compete with each other. This event is not about winning, it's about maximising earning, as teams are reminded at the half way mark. In the second phase of this exercise teams are challenged to "score as many points as they can" and to think differently about how to achieve this. They become much more collaborative, share information, work together, and in most cases will double, triple, or even quadruple what they earned in the first phase. As a result this exercise genuinely demonstrates the power of collaboration over internal competition, and refocuses the group on competing externally, not internally. 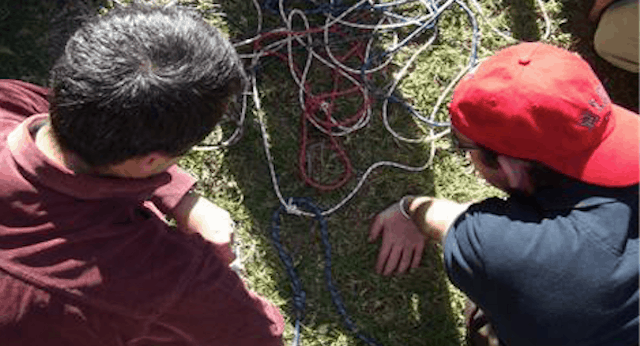 What happens during the Team Challenge team building activity? The event is introduced in your conference room where the teams are given their objective, a map, the rules, and a list of point scoring opportunities at different locations. Teams earn points by locating and completing tasks and by locating mystery markers. What's the mystery? You don't know what they are worth until you get there. The teams are rewarded on the completion of each task, according to the level of success, or otherwise. Loss of points is also possible. The tasks are a diverse and bizarre range of problem solving activities, each requiring a fresh mental approach and solid team processes. When teams return to the conference room points are tallied and the discussion begins. The event is about the difference between competition and collaboration. It is run in two separate phases so that teams can see the outcome of both approaches. Normally the second phase will earn three times the first, demonstrating that if you are competing with colleagues you are hurting yourself and your overall performance. A big picture perspective, remembering that we all work for the same company, and practicing the interactions required to be collaborative are what this activity is all about. On top of this each team will have to plan, problem solve, communicate, and collaborate - all with the big picture in mind. Positive competition and collaboration will result in a great outcome for all. But action without planning, cooperation, or a big picture focus will minimise the final outcome. Minimum and Maximum time required: Because of the two phases this activity requires a half day - 4 hours. Minimum and Maximum group size: Ideally you need at least 30 in your group, and they will be broken into teams of about 7 to 8 people. There is no maximum - this activity has been run for groups as large as 1,000 people. The Team Challenge is dependent on the right venue so enquire now to find out if this great activity can work for you. How does your organisation function and will that be reflected in the Team Challenge?